An Umbrella insurance policy is an additional limit of liability protection that covers over the underlying policies covering personal auto, home, rental property, motorcycle, classic car, RV and similar vehicles. Some people mistakenly refer to the umbrella insurance as “excess” coverage but there are important differences you should be aware of. These days just about everyone can benefit from the coverage of an umbrella insurance policy but as your wealth, assets, or income goes up, it is a vital part of protecting wealth and standard of living. Let’s face it: No matter how careful you are we all make mistakes. Some of those mistakes cause injury and hardship to others and in our litigious world that can be expensive to defend and impossible to afford without umbrella insurance. Any reasonable method we can use to diminish or eliminate our vulnerabilities to casualty loss is money well spent and this especially true for who could be devastated financially in a court of law. There are policies that are similar to umbrella liability policies. These are really called “excess” insurance. The critical difference in excess liability policies is that they strictly follow the language of underlying auto, home, and other liability policies you maintain. The excess liability policy is not capable of filling in for voids in underlying policies like an umbrella liability policy can. The “follow form” trait of the “excess” liability means that “excess” an insurance policy cannot help eliminate holes in underlying coverage. In this way “excess” liability coverage merely adds its limit on top of the underlying coverage. Excess coverage is better than none at all but the preferable form of coverage is personal umbrella insurance protection. Whether umbrella insurance or excess liability coverage, these policies require minimum limits of coverage on underlying liability policies. The cost of umbrella insurance coverage is very small for the limit of coverage provided so the underlying policy limits are required to protect the umbrella from becoming primary coverage if at all possible. The underlying policy limits can be considered the coverage deductible before the umbrella insurance policy limits will be effective. If the underlying policy does not afford protection the umbrella insurance policy may still provide and pay for the cost of defense and the payment of the claim. Typically the Umbrella insurance is provided in layers of $1,000,000 over the primary policies. Umbrellas limits up to $5,000,000 are available but our underwriters exhibit some caution as the limits increase to make sure that there is some sound underwriting or financial reason for the higher limits of umbrella insurance. The traditional image of an umbrella that comes to mind is the reverse of the one shown above. We use a real umbrella to help keep water off our head. 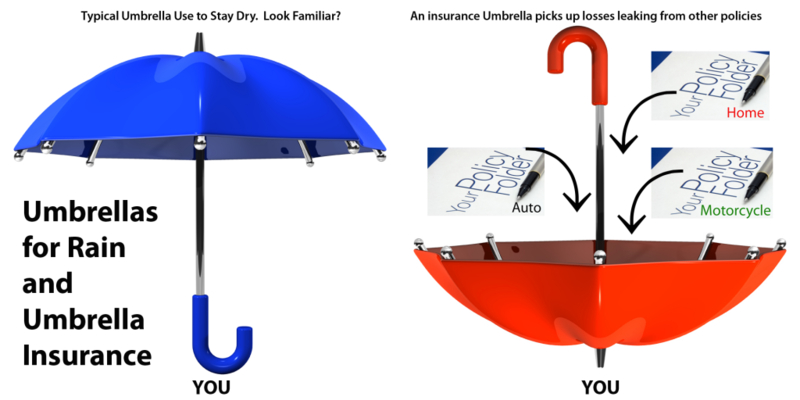 The reversed image of an umbrella, as shown, describes the role of the insurance umbrella much more appropriately. It shields you from the cost of losses that leak through underlying coverage either because they have some inadvertent hole or their primary limit is exhausted in the defending the loss. I am an insurance agent with considerable experience working with clients that span the spectrum of wealth. As an agent with advanced industry credentials in financial planning and advising I suggest the benefits of umbrella insurance as a way to protect significant assets, property or the ability to produce an income. Have the right coverage isn’t just important to protect what you have but your ability to get where you are trying to go financially. Although large, expensive and damaging claims are not very likely to occur, the concepts of risk management work to expose the best methods of eliminating or mitigating the risk to catastrophic financial loss and umbrella insurance almost always leads the choices of protection or utilizing methods of handling or mitigating the risk. Personal Umbrella insurance is inexpensive because the chances of loss are small but when an umbrella insurance loss does occur, it will be expensive. Umbrella insurance costs less than $1 a day for many and some of us will pay even less. Contact us about your personal and business insurance needs including a conversation about umbrella insurance. We’re available by appointment almost any time and almost always for walk in visits Monday through Friday, from 9-5. Call us at (513) 779-7920 and ask for Terry McCarthy.